This Knight rides in on a strong, sturdy workhorse. Physically, this card focuses on strength and longevity. Focus on long-range health goals and remember that daily small habits develop into long-term strength and stability. This is a card of dedication to good habits. In regards to physical health focus on strength and endurance. This particular Knight speaks of persistence, dedication and the ability to reach long range goals. Unlike the other knights who ride in swiftly then lose steam; this Knight rides a strong steady workhorse and is ready to stay for the duration. This card speaks of mentally preparing yourself for success. Find goals you are passionate enough about to stick with. It may help to break your larger goal into a series of smaller ones to enhance your motivation. 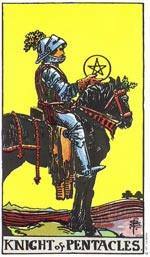 This Knight appears on a strong steady workhorse and he is ready for the long haul. He speaks of resilience and the ability to keep actively pursuing higher goals. Spiritually speaking he is a card of continued growth and expansion through experience and dedication to personal growth and awareness.